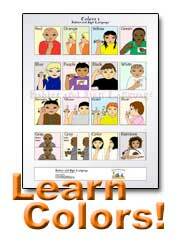 Baby Sign Language Classes - Virginia, Richmond, Founder, Springfield, etc. Details: The Sign, Say and Play(TM) class is a 6-week play class for parents and their babies. It highlights signs that are most important in the lives of babies and teaches signing through fun activities and songs. The play activities reinforce important language, cognitive and social- emotional skills. Signs related to mealtime, bedtime, bath time, getting dressed, at the park and pets are taught in this class. The More Sign, Say and Play(TM) Class follows the format of the Sign, Say and Play(TM) class, but focuses on signs related to feelings, outside, farm, safety, zoo and birthday party. Parent Workshop: This one-time introductory workshop teaches everything you need to know to get started with the Baby Signs® Program. I also provide Early Childhood Educator Training. Fees: $132.00 for Sign, Say and Play(TM) Classes and More Sign, Say and Play(TM) Classes. All classes and workshops include a kit to help with signing at home. Details: The Baby Signs Program teaches babies to use simple, easy-to-do gestures for communicating with their parents andcaregivers. These gestures or signs represent an item or concept, like cat, eat, or all gone. Using signs gives babies a way to talk with their parents, before they can talk. Babies can communicate about the world around them, long before they have mastered their verbal speaking skills! The Baby Signs Program is based on the groundbreaking Baby Signs Research which began an international movement to teach hearing babies to use signs. After 20 years of careful study, Baby Signs Researchers proved that using signs actually enhances language, cognitive, and social-emotional development. The Baby Signs Institute offers parent workshops and classes to teach parents how to use the Baby Signs Program at home. Classes and workshops available in 4-weeksessions. 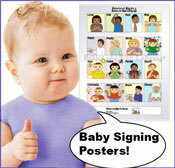 Return from "Baby Sign Classes in Virginia" to "Infant Signing Language home page"